What was the best street-going Jaguar ever built? When we visited Jay Leno’s garage in Burbank, Calif., recently, we think we saw the answer sitting near the door and ready for use. After we looked it over, Jay graciously gave us the chance to drive it, clinching our first impressions. It’s a relatively unassuming red Jaguar that probably gets as much use as any car in Jay’s collection. At first glance it appears simply to be a nicely maintained E-Type roadster, with the long, curvaceous bonnet tapering back to the two-seat cockpit and short rear deck that were the hallmark of all E-Types. But to anyone who knows the key changes that took place during the E-Type’s 13-year evolution, there’s something slightly askew. The body has the graceful faired-in headlamps and modest bumpers of the early series E-Types, but they flank the large chrome grille that wasn’t added until the Series 3s. And how do you explain the V12 insignia on the rear deck and the slight fender flares that cover tires wider than any that ever shod the straight-six Series 1s and 2s? The differences are there because this is Jaguar builder and restorer Jason Len’s improvement on Jaguar’s own creations. This was the car Jaguar might have built in the early ’70s, had the company not been hemmed in by mundane constraints such as environmental and safety regulations. A closer look shows that this car combines the best of the body lines and short wheelbase of the Series 1 E-Types with the power of the V12 engine that motivated the heavier, longer and clunkier Series 3 XKEs. But how did it come to exist? In the 1950s, when Jaguar planned the replacement for the very successful line of XK120, 140 and 150 sports cars that established its reputation as a major automobile manufacturer in the years after World War II, the company knew it had a tough act to follow. But Sir William Lyons was up to the task. Since founding SS Cars in Coventry in the late ’20s, Lyons had proved he possessed the intuitive understanding of pleasing lines given to only a few great artists, combined with the sharp-pencil thriftiness of a Dickensian accountant. With these two attributes, Lyons had produced a succession of cars that were as revolutionary in design as they were practical in cost and value. The E-Type Coupe that raced overnight from Coventry to Geneva, got a quick wash and polish, and then debuted before the press on March 15, 1961, in front of the fountains of the Parc des Eaux Vives near the Geneva Motor Show hall was a combination of creative style, innovative engineering and affordable value that would inaugurate a new era in sports-car design. In fact, the only complaints voiced by the press were to question whether a car so clearly competitive with limited-production Italian performance cars could be produced in the volume and at the price that Lyons was promising. The lines of the car, especially the long, single-piece bonnet with faired-in headlamps, were stunning—one might even say salacious—in their appeal. 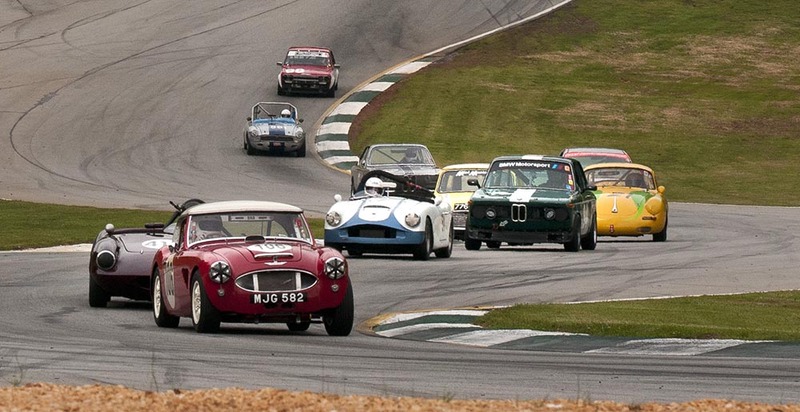 They were clearly inspired by the D-types that had been winners at Le Mans from 1954 to 1957 and closely followed the lines of two prototypes, one of which was raced at Le Mans in 1960, that adapted the D-type’s lines and structure to production demands. 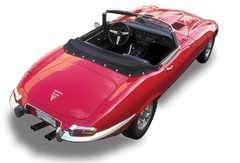 Underneath, the E-Type chassis wrote new rules for how to design an efficient and strong sports-car platform. There was a stressed-tub monocoque structure from the front bulkhead back to the rear of the car, and a sturdy square-tubed space-frame extension on the front to which the front suspension structure and engine were mounted. The engine, however, was anything but revolutionary, with thick-wall, cast-iron engine-block technology that had been old before World War II. Nevertheless, Jaguar engineers had continuously improved the powerplant since its introduction. In its Series 1 mode, similar to the upgraded XK150S engine, it offered 3.8 liters that could produce 265 horsepower and 283 lb.-ft. of torque, no slouch by the standards of the day. From that point through the end of production in 1974, evolution was a two-way path. On the one hand, engine research continued to move forward. The proven double-overhead-cam straight six was upgraded to 4.2 liters in 1967 in the Series 2s. 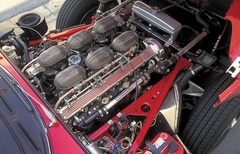 Then in 1971, Jaguar introduced the groundbreaking 5.3-liter V12 for the Series 3, the first postwar V12 offered by any company that was cheap enough for volume production. With these developments, Jaguar was able to continue to offer competitive performance in the face of increasingly stringent U.S. environmental regulations. On the other hand, U.S. safety regulations were doing the E-Type no favors. Required changes included heavier bumpers, larger taillights and exposed headlights, while coping with the environmental changes in the engines mandated successively larger grille openings. Efforts to smooth out the styling and increased passenger comfort resulted in a longer body style, which was first introduced on the 2+2 Series 2 coupe, then made standard on the Series 3s for both coupes and roadsters. By the time these evolutionary changes reached their climax in the 1971-’74 Series 3, the roadsters had gained 911 pounds. They had also added 14.3 inches to their overall length, nine inches to their wheelbase, 4.5 inches to their front track and three inches to the rear track. The grille was now a large chrome rectangle, covered by what one journalist called a cross between a cheese grater and an animal cage, buttressed by rubber battering rams. The headlamps, once faired into the fender lines, now stuck out in front of and above the headlight opening with ungainly chrome trim. The rear end looked little better, with shoebox-sized taillights butted up against the same ungainly rubber overriders found on the front. 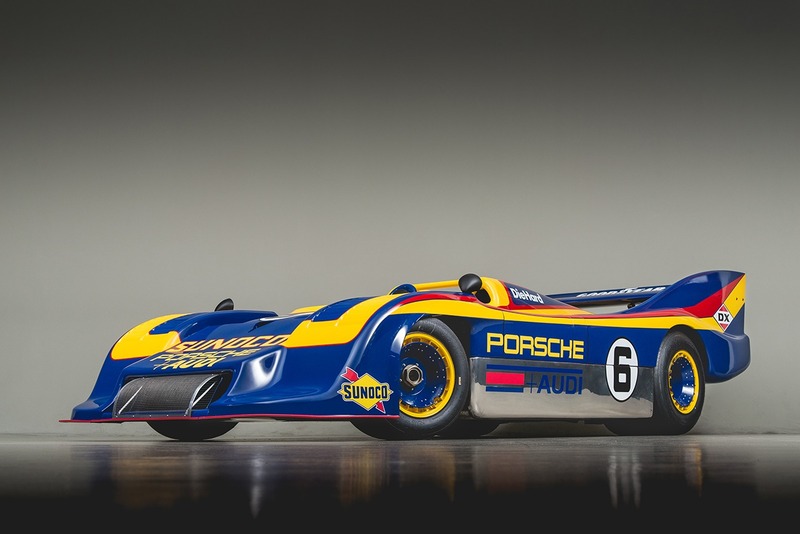 About the only improvement was that the bodyshell had been widened and supplemented with subtle flares at the wheel openings to cover the broader track and wider tires. Few Jaguar enthusiasts haven’t ruminated in idle moments about whether that incredible V12 from the Series 3, with its 272 horsepower and 304 lb.-ft. of torque, could be swapped into the understated lines of one of the early roadsters. Jason Len was no different. Except for one detail: With the service department, restoration shop and parts stores of his San Luis Obispo company, XKs Unlimited, at his disposal, he had the capabilities necessary to indulge this whimsy. But the approach wasn’t as simple as one might think. Jason realized that the structure of the E-Type had been significantly altered to handle the differing dimensions and demands of the V12. So rather than swapping a V12 into a Series 1, Jason chose instead to graft the body of a Series 1 onto the chassis of a Series 3. Not wanting to sacrifice a roadster body for the project, Jason chose a derelict 1972 E-Type 2+2 coupe as his starting point. The roof was cut off, then the body was sectioned in half to remove those extra nine inches of wheelbase. A Series 1 tail section replaced the 2+2’s rear body, but Series 3 flares were fitted to the fenders to cover the wider wheels. The longer doors of the Series 3 had to be replaced with shorter ones from a Series 1, which required reworking the complex E-Type doorjambs. In addition, the wider Series 3 front bonnet had to be redone to accommodate the chrome surrounds and glass fairing of Series 1 headlights. Even the convertible top proved to be a problem. 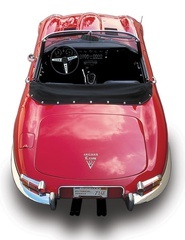 The Series 3 windshield was 1.5 inches wider than the Series 1, so a Series 1 top frame, which would bolt to the body in the rear and fit around the door glass, was too narrow where it met the windshield. Sectioning and proportionately widening the top bows solved that problem. As a final touch, Series 1 bumpers, little more than trim pieces around the corners of the body, were cut and sectioned so they would stretch around the fender flares. With the chassis and body panels completed, Jason turned his attention to the mechanical issues. Here the goal was to go Jaguar one better than even the Series 3’s respectable performance, taking advantage of Jason’s experience building racing engines but staying within the parameters of a car that would be comfortable to drive in traffic. Obviously, the first thing to go was the complex system of hoses, pumps and breathers required for engine emissions standards. As a 1972 car, the Jag was exempt from California emission regulations and testing. The air-conditioning system was also removed to save weight and enhance performance. The 5.3-liter V12 was replaced by a 5.7 liter engine, and the pistons and sleeves were replaced. The four Zenith-Stromberg carburetors from the stock engine, each serving three cylinders, were replaced by a modified manifold mounting six Weber IDF carburetors. The head was ported and polished, and the two overhead cams were reground to upgrade responsiveness. The flywheel was lightened, and all components of the engine were blueprinted and balanced. The engine was fitted with stainless steel headers and a big-bore exhaust, again a simplification from the complicated muffler system of the stock Series 3. To accommodate the engine’s power and performance, an XKs Unlimited five-speed transmission conversion was fitted, which uses a Ford T5 transmission as its core. This was mated to a limited-slip differential and 3.70:1 rear end. Finally, the suspension was upgraded with bigger anti-roll bars, adjustable shocks and slightly stiffer springs. Vented disc brakes were fitted all around, with Wilwood Engineering alloy four-piston calipers up front for added stopping power. The suspension was finished off with 15x6-inch Minilites to give it a ’60s racer look. Wider wheels might have been desirable, but they would not have fit under the stock Series 3 fenders. The car is fitted with 225/70R15 tires, just a bit wider than the stock 205s originally fitted to the Series 3 V12s. Although Jason might have preferred the look of the metal-faced early Series 1 dashboard, adapting it would have been a monumental task, so he stayed with the interior trim of the Series 3. The only visible adaptation required was changing the contours of the transmission tunnel trim to accommodate the five-speed gearbox. 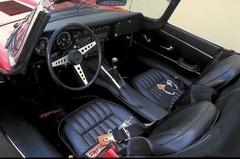 With all this structural and mechanical work completed, the car was given a top-quality restoration, with new interior trim and exterior paint befitting its unique characteristics. Of course, the V12 emblems from the original trunk lid were fitted to the new car. More than one enthusiast at an auto show has been tripped up by this when walking around what appears to be a Series 1 XKE. Jason drove and enjoyed the car for several years, but he made the mistake of driving it down to Los Angeles on a trip to consult with Jay Leno about a Jaguar he was restoring. Jay took to the car immediately and offered to buy it on the spot. Jay had always been an E-Type fan, but he wanted the one Jaguar never built: an early short-wheelbase car—but with a V12 engine and a manual transmission. Jason had built the car of Jay’s dreams, but he was having too much fun with it himself to sell. Then, as often happens, reality caught up with Jason in the form of a house-remodeling project. His daughters were growing, and they needed more space. Jay had not withdrawn his offer to buy the car, and the money would make a nice dent in the Len family’s remodeling costs. Besides, for Jason, satisfaction comes with problems solved, and he was ready to move on to other challenges. So the title was transferred, and the E-Type moved to Burbank. 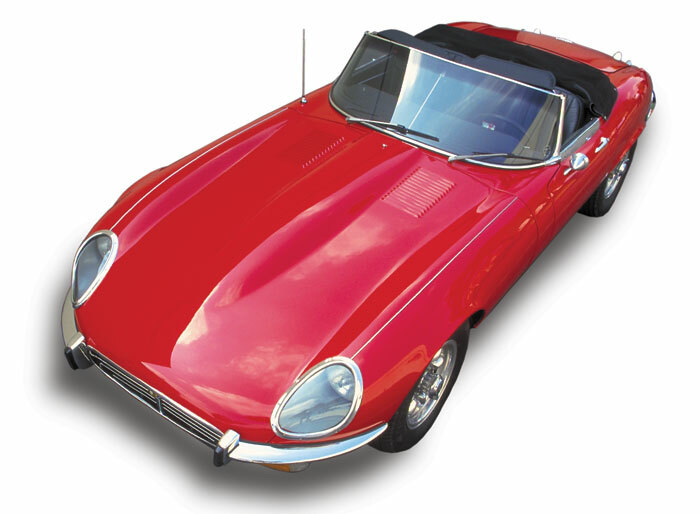 For several years now, the red E-Type has been a frequently used mount in the Leno stable. Surprising to those who know the quirks of Jaguars, even overheating isn’t a problem in Burbank traffic. The aluminum block and head, and larger water passages of the V12 engine, especially with the removal of all the smog equipment and the air conditioning, minimized the problem. Tuning the car to run properly rather than to meet emissions requirements also significantly reduced engine heat. Any long idles in stop-and-go traffic are more than easily handled by two heavy-duty thermostatically controlled electric fans. Since acquiring the car, Jay’s shop foreman, Bernard Juchli, who is well known in Jaguar vintage racing, has made a few changes to the shocks, springs and suspension and added the 70-series tires to improve handling and get a little more road clearance. Bernard also made some changes to the tuning and timing to improve the car’s street manners. With the changes, Jay notes that the power steering is a little light, the overall feel of this car is of a true sports car of the ’60s. The red Jag may not turn heads on main streets quite as readily as does the Merlin-powered Rolls-Royce or some of the other more outré cars in Jay’s collection, but he reports that it is a satisfying car to drive. As well it should be. Jay says the main difference between this Jaguar and others is how much power it has. Jason reports that the car has been dynoed at 375 horsepower at the rear wheels, which makes it more than adequate to impress owners of more recent high-powered performance cars. 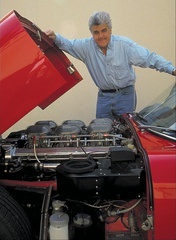 The marriage of the short wheelbase of the Series 1 with the lighter engine—the big V12 is, after all, made of aluminum instead of cast iron—coupled with a nicely tuned suspension makes the car a dream to handle at high speeds and on the challenging back roads north of Los Angeles that Jay frequents to blow the cobwebs out after high-pressure days at the studio. And the soundtrack to this one-off creation is just as satisfying. “I love the sound this car makes,” Jay reports happily. With six Webers breathing into 12 cylinders and out through those custom headers and racing exhaust system, the Jaguar’s song is a dead ringer for that of a Ferrari Daytona. What we know is that this car is more powerful and handles better than the best of the last V12s. At the same time it embodies all the graceful styling that caught the world’s attention in Geneva in 1961. For two California gearheads, a builder and an enthusiast, there are no doubts: For all-around enjoyment, it’s the best Jaguar they’ve ever owned.